The design aesthetic of your website plays a huge role in the actions that your website visitors take. In the long term a quality product that addresses a need and delivers impeccable service will ensure you have a long lasting and successful business. But, if your website is failing to convert visitors then all the hard work you put into your products or services is worthless. We see some amazing products and services from marketers and business owners that fail to develop and grow as they should, because their websites do not build confidence and trust, leading to visitors that leave the site without taking action. Here at OptimizePress, we have run countless design tests, troubleshot hundreds of thousands of customer websites and have highlighted some key design points that make for a highly engaged web page. The result of which has lead to the discovery of some common website mistakes, which lead to lack of content engagement and have a negative effect on conversions. In this article, we’re going to review these mistakes and introduce some BRAND NEW row options, which have been added to OptimziePress to help you alleviate and avoid these potential pitfalls. The purpose of every landing or sales page is to encourage your visitors to take ‘one desired action‘. Anything more than that will often confuse and frustrate your visitor, resulting in a high page bounce rate and a loss of engagement. Websites with a mix of video, images, bullet points, headlines and copy can often distract attention from opt-in forms and buy now buttons. This can lead to users exiting away from your page if they can’t easily locate opt-in forms or buy now buttons. With the ‘Fixed Row On Scroll’ feature, you will now be able to consistently show the most important element of your web page to your visitors and customers regardless of where they scroll on the page. This means you can display the elements that matter most, such as an opt-in form or ‘Buy Now’ button. This means when a visitor scrolls past a row with a web form in, you can choose to fix that row to the bottom of the browser window, so it’s always in the visitors line of sight. TOP TIP: We recommend that when you use this feature, you set a minimal row height so that the fixed row does not dominate the browser. Website behavior studies discovered that it takes approximately 4 to 5 seconds to engage a web visitor before they decide to either leave your website or to continue browsing. While the quality of your content and good design is imperative, the challenge is finding a balance between having lots of informative content while at the same time not overwhelming the visitor and confusing them as to the action they need to take. 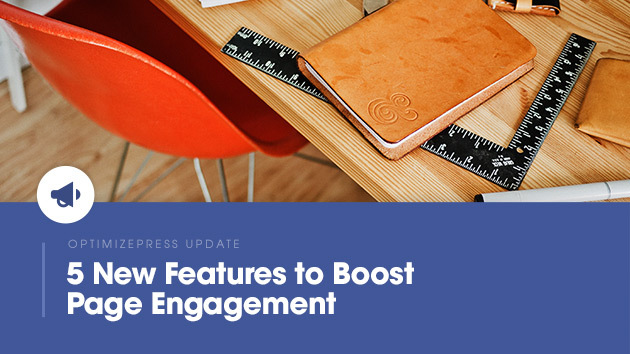 The new ‘Engagement Scroll’ feature is a subtle but highly effective optimization tweak to your pages. You will now be able to place a pointer to the bottom of the rows to encourage your readers to scroll and continue reading. 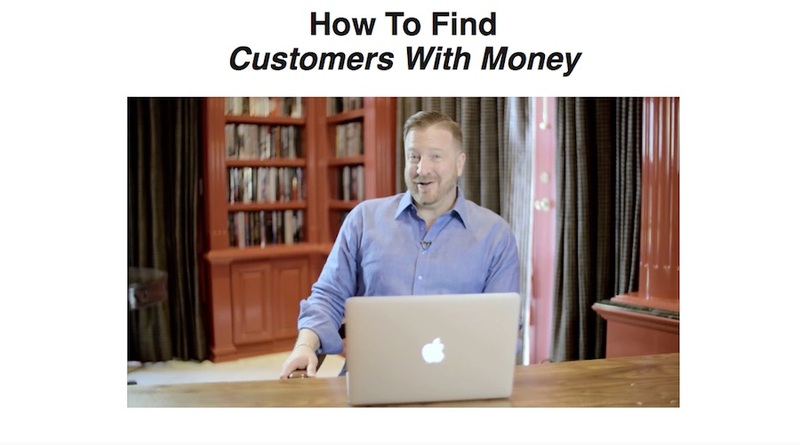 Using this in conjunction with a well written sales message will turbo boost your customer engagement, further increasing intrigue, building authority and the eventual conversion success of your website. As we covered at the start of this post, we only ever get one chance to make a first impression. If you have a poorly structured site, with a dated and tired design then visitors are going to lack confidence in your products ability to deliver the service or goods that you promise. This will have a negative effect on the site’s success in converting visitors into subscribers and customers. It’s imperative that we structure our site in such a way that it showcases modern design aesthetics and professionalism. You want to reduce the overall site bounce rate. What if there was a sure-fire way to ensure you make the perfect first impression? How would this affect your overall engagement and revenues? With ‘Parallax Rows’, you will now be able to draw visitor attention to the key content and calls to action areas by using modern contemporary aesthetics; further boosting customer confidence and removing doubt from your visitors. Mistake #4: Failure To Maintain On Page Interest. The simple fact is, new and shiny will always win over flat and boring. While the sales message or content on the page is important, presentation and design play a huge part in a web page’s conversion rate. Website visitors need more and more encouragement and reason to stay on a page. With an abundance of websites now live on the interwebs and other distractions to compete against, it will be to the detriment of your business to not focus on ways to increase your page presentation in order to sustain your customer’s interest. An effective conversion technique is to show content to visitors at the time when they can action it. Let’s say for example you have a sales video on your page, you want visitors to watch that video and not be distracted with other elements of content on your page. With ‘Row Delay Animations’, you can now hide the rest of your page content until such time as your visitor is ready to take action. So in this example, you might choose to delay the rest of your page content for 30 seconds until your visitor has started to engage in your sales video content. Now you can draw attention to the most important parts of your page, and then encourage visitors to take action by presenting more content when they’re ready. Best of all, this can easily be setup with just a few simple clicks. As we covered in point #3 visitor confidence, making the correct impression is paramount. Often marketers and businesses make the mistake of not projecting the image that matches their customers’ expectations, this leads to doubt and skepticism in the product or service and visitors are likely to exit your website without taking any action. No matter how we analyse it, visual aesthetics make a difference when you need to grab peoples attention. Once you have made the right impression, the value of your content will covert the visitor to become a subscriber or customer. A great way to make an instant impression is by using amazing row background images, these enable you to really capture visitor attention. You can find out more about background image sources from this OptimizePress blog post. Using our new image background settings you can now customise row backgrounds to fit with the colour scheme and style of your pages without having to hire a design or learn how to use an image editing software. Once you have uploaded your image background you can add a colour overlay and also adjust the colour opacity. This not only enhances the overall look of your page but it allows the content on the row, such as opt-in forms and buy-buttons to be presented in perfect contrast. BOOM! These BRAND NEW row options are available now in OptimizePress V2.5.8 onwards. If you have any features requests or ideas for new features you would like us to add then please comment below. 84 replies to "5 New Features To Boost Page Engagement"
Ian, I want to implement an upside down homepage with a welcome gate. Do you have anything like this on the roadmap in the near future? Hi Jason, we do have something being tested now. Regarding the upside down page this could be created form a an existing template. David, Thanks for responding. I did take a look at existing templates, especially in Marketplace. No luck there. I’d much rather buy one for $10-$15 rather than taking time to design one on my own. If you need a beta tester for the welcome gate, please keep me in mind. A transparency setting on the feature block! Hi Alex, have you submitted your feature request over at http://featurerequests.optimizepress.com ? It just shows how far behind the game Optimizepress have fallen if they consider any of this “new”. These features are standard or can be implemented by just about any page builder out there. Agreed! Their builder was very clunky and old fashioned to begin with, and it has completely stopped working with each WordPress update. Deeply regret my purchase. I’ve got no issue using OP 2.5.8.1 with the latest WP 4.7. which OP version you’re using? We have lots of new features and products on the horizon here at OptimizePress, so I’m sure 2017 is going to be a fantastic year. It would be more productive to solve first the issues I reported so many times but never got an decent answer. Thank you for the offer, but no thank you. I´m just curious… what are the issues you refer to? What about a News Feed that scrolls and you can click the link on the message that suits you? I can do it in Java but it would be cooler with it built in. Hey Heavy357, Have you looked in the Marketplace? Do you have example designs you would like? Ian, thanks for the updates. We love OP. Loving these awesome new updates Ian! I bought OP a few years ago and have not got around to using it. Just now I need a membership website for my new WP plugin. WP Tube Ultimate, is this sort of member ship website secure? Any tips help thank´s. P.S. This has never been done before that is why it must be secure :) only for members. If you need to create a members only area and secure the download file then OptimizeMember will work great for that (especially with Amazon S3). You can actually use about any membership plugin available as well if you already have something you like using. Hey Kevin, thank´s for the feedback. Love, love, love this new update. Just made OP2 even more exceptional. Thank you gang, for your hard work. One of the best OP2 updates ever! Row delay was a HUGE improvement!! Keep it up guys! Awesome! Cheers Diogo. Enjoy using them on your pages! Amazing updates! Already using them and they rock. Also, do any these work on the blog pages? Very cool. I particularly like the sticky row. Thanks to all of the OptimizePress team. Thanks Ed! The sticky row feature is really cool! I like OptimizePress great platform sometimes building a landing page etc. gets kind of complicated to me, especially the Blog pages. I am not a snap crackle pop type of Guy maybe I am just reaching for an easy button as one would say? However Thank You for all the years you have been around I have been a customer for 6yrs now. p.s sure wish you had and autoresponder system. Thanks for being a long time customer Rob – we appreciate it! We do have some developments in the blog and blog theme areas coming soon which hopefully might help with those areas you’re struggling with. No plans to develop an autoresponder system at present I’m afraid but there are some great options out there now in this area. We have some news on this coming *very* soon! Nifty tips Ian, thank you! Thanks Andrew, great to see you here! That’s awesome! I’ve already put these into place and loving the plus pack as well. Thank James! Very useful updates! Will definitely be incorporating them. New feature request: any chance we can have an option to “automatically link” together all pages in a sequence? Hi James. I’ll provide more clarity in the feature request section now. Thanks again. You guys never quit improving OP and that’s why I’ve remained a customer and advocate. Awesome to see you not resting on your laurels. And great content as always. will include some of these new features in my upcoming templates. keep on going and improving guys! Awesome thanks KM – we look forward to seeing those templates! Большое спасибо за крутое обновление! С любовью из России! Я обожаю OptimizePress! Спасибо Иван! Так велика вам нравятся обновления! A W E S O M E!!! Thanks guys!!! “Frank Kern – Chief Engineer, NASA (Ret)”.. are you sure..
Hey guys these new features are really great, thanks! But i’m curious about if you remove the delay timer for elements? Awesome and incredibly useful updates! Thanks so much — these will save me a lot of time! It’s amazing how far everything has come since Optimize Press. We got in towards the end of Optimize Press 1, and then OP2 came out. Now, you guys pretty much have it all. Once the membership side is dialed in, this will really be the ultimate web site building tool. I feel for membership programs, having a page template that utilizes the already developed tools, but is best designed for the mobile experience. Also, taking some of the basic functionality from LMS software, would really enhance the membership side. Like starting a course when the user is ready (by a button). Making the lessons follow consecutively and having a way for the user to mark that lesson complete. That would be epic. P.S. We have an iOS and Android mobile app working with our OP2 site. Loving the new features, but just waiting for the courses to be upgraded before we really push it. Thanks for feedback! Have you submitted some of your ideas on the new feature request area? I thought the same thing, when I read about the new features of optimizepress! Where are the updates for an LMS within the member area? When this happens, optimizepress will completely settle all existing LMS. I am optimizepress fan for several reasons. And I also have 5 applications, and I have 2 applications, using OP. Would love to see them? What are some of your apps? Hey where are now the delays for elements? Hi Juan, the delay setting are in the row. Have you update to the latest version? Is OP Support still active or working properly? OP Support is being non-responsive. Now many of my images will not publicly display including company logo on every page and many background images. It’s hurting the brand and look of my site. Sales have dropped off considerably. I can’t replace the images that do not display simply because media will not allow for new uploads anymore since OP Support made changes. Further none of my images in media will display. Plus I also lost all my comments which served as valuable social proof and took a year of sending paid traffic to build up. I even other authorities in my space leaving positive feedback but now its all gone based on changes OP Support made to my site. Unfortunately, with no further communication from support, no phone support, this blog became my only hope at getting the proper attention required to fix something that is a direct result of changes to my site that OP Support made in response to an older ticket that is still unresolved. I tried to reply and notify support who asked me to reply if I had any further problems, but I couldnt because they closed the ticket before I could respond. I created new ticket but its been over a week and no response. Is your policy still the same in that support requests will be answered the following working day? Or are my messages just being missed by support? Can someone at OP please help? ©2010-2019 OptimizePress. All Rights Reserved.